If my maths is correct – then it is 169 years to the day since the first Sunday services were held in this church: it was dedicated on the feast of St Denys, 9th October 1845, which I think was a Thursday – making the following Sunday the 12th as today. And here we are 169 years later using almost the same order of service. Certainly the spoken parts of the service would have been familiar to our founders – Ekaterina Woronstov and Sidney Herbert – and to all those who suddenly found themselves worshipping not in the old church in the Market Square, but in the more spacious and possibly rather alien surroundings of their new parish church. And of course the building itself is much as they would have found it in 1845 – yes the pews have changed a bit, the gas flares have been replaced by electric lighting and I’m sure it’s considerably warmer that it was then – but it is essentially the same. Outside, however, the landscape has changed much more dramatically. If you take a look at the front of your pew-sheet, you will see a picture of the church – familiar in most respects – but without the War memorial which is now a permanent feature: the events of the 20th Century which would brought that about were still unimaginable when this church was built. The British Empire was still a long way from the full extent of its influence, the Anglican Communion had not yet come into existence. There are line drawings of the early years here – with elegant horse drawn carriages and ladies in large dresses – and rows of tiny, neat trees dotted in the grounds. Quite a long way from the present busy main road and the small jungle that towers over the Rectory garden! Yet, for all that, I think it is the social landscape – the changes in outlook and beliefs – that has changed most radically since 1845. Some of those changes we may regret, while others we will certainly recognise as improvements. Few of us would want to go back to the days of the town workhouse, for example, whatever the shortcomings of the modern benefits system. And as we survey the landscape today, I think that we need to be prepared both to challenge the prevailing culture, but also to learn from it, if this building is going to remain a Parish Church in any meaningful sense – if it is to retain its potent symbolism as a kind of guardian angel at the heart of this community. And that of course means that we will NOT just be doing the same kind of things that our Victorian forebears did – nor even those of the 20th Century. In six short years, my role as Rector here has changed beyond recognition – and I find myself now doing a job that I was certainly never trained for and which is a very, very long way from what I thought I was letting myself I for when I went forward for selection back in 2000. Well – it’s a bit unsettling at times, trying to work out what’s coming next, but then, at Ordination, we were reminded not only that the Church of England “professes the [historic] faith that is uniquely revealed in the Bible and set forth in the Catholic Creeds,” but also that “The Church is called to proclaim that faith afresh in each generation.” Taken together, those things imply that we should be constantly on the lookout for signs of the new things that God is doing – and adapting, changing what we are doing – learning new skills – in order to try and catch up. Historic and imposing as our building may be, we must never allow it to be seen by anybody as a museum – never JUST part of the landscape here. It is the powerhouse from which the gospel is being proclaimed in this community – or not. We’ve hit the front pages twice in the past month – not quite what we’re used to! Once it was because of the Credit Union here and once because of the collapse of the Youth Service which, together with the wardens and 2 fellow clergy, I am currently battling to do something about. Now, to most people, neither if those things probably seems very churchy – but I think they should! They both touch on matters of justice and they are both concerned with liberating individuals in need and enabling them to realise their God-given potential. So no, I certainly never wanted to learn about banking systems and still less the workings of Wiltshire Council – bit I WILL do if that’s what it takes to be able to speak the gospel and live the gospel in Wilton 2014 and onwards. And yes, if I’m going to survive the experience I will need you to “flex” with me – not just your prayers, but your ongoing help as priorities emerge and change. Taking on new things, learning new skills, is time consuming and demanding – physically and mentally – and none of us can take them on AND keep doing everything that’s always been done before. Change means change – not added extras bolted on. A changing landscape demands changing expectations in the roles that we all fulfil – within the Church and beyond. And it needs all of us to be active in changing the perception of the Church among the many other people who have little or no time for it. In short, we need to demonstrate that we ARE interested in life beyond these four walls – we need to learn to SHOW that Christ came to bring “life in all its fullness”. It may be that we are already DOING all that we can or need to do – but perhaps we aren’t yet connecting those good works into the faith which is there to sustain us in our work. And that connection needs to be clear – not just for our own wellbeing, but for the sake of proclaiming the gospel afresh in THIS generation. And what of this building in all that? What of this “House of prayer” that stands as a reminder of the confident faith of its founders? I’m sure THEY would have been entirely in sympathy with Christ’s words and actions in today’s gospel – as he cleanses the Temple of the money changers – and that they would have interpreted them in quite a literal sense. 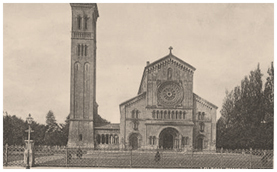 After all, the Victorians were not only prolific builders of churches but also of Church halls – they liked to separate the business of praying and worship from the more worldly aspects of life: very different from what would have happened when Wilton’s previous, mediaeval, parish church was new. And while I would NOT want to go back to that implied separation between the Church and the world – I do value the notion that we need precious buildings like this to provide a “powerhouse of prayer” – to enable us to go into the world around us with confidence and clarity of vision. That notion was very much a part of the Church’s dramatic revival in the 19th century and I think it’s still relevant to us. One of the things that impressed me coming here was the fact that we do maintain daily prayer here – that there are lay people willing both to lead and attend worship throughout the week. That matters hugely to me – even when I’m not here – to know that the whisper of prayer is alive and constant. And I’d encourage those of you who are not at work at 9.30 in the morning to consider joining us – even once in a while – to add YOUR voice to those prayers. We spoke at our Annual Meeting this year about making it a priority to “invite” people – to our services and to other events. With everything else on the horizon, I fear that aspiration may have fallen of the agenda in recent months – but perhaps we can start to think more seriously about it again. Who are the people that YOU know well – who might just enjoy half an hour here on a Tuesday morning at The Coffee Corner? Who near you needs to know about the All Souls’ service in a few weeks? Do you have any neighbours who have never been to church here, or may have had bad experiences of church in the past, but could now be encouraged with a friendly word? The best way of bringing the life of the world into our worship, the best way of demonstrating our continued relevance and commitment to the community around us – the best way of listening to and responding to the needs of our neighbours is to invite them here with us – so that we can listen to each other. I think it is at our founders’ request that words painted high above you include the phrase “My house shall be a house of prayer”. May that aspiration be both our starting point and our goal – may our prayers here inspire us and strengthen us to take the gospel to all who will hear and enable us to draw them into this house – to blend their prayers with ours and with all those who have worshipped here before us.